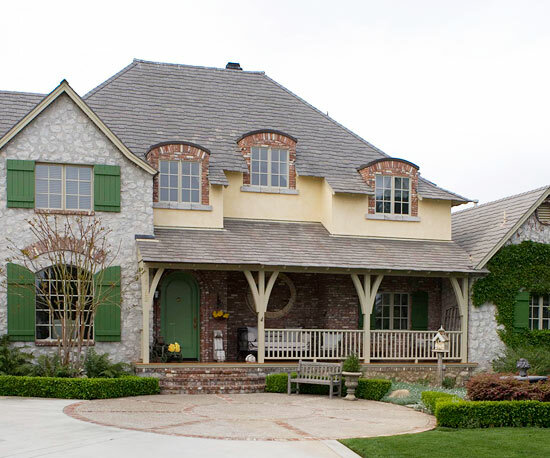 If you are considering building a Country French-inspired home, you might want to start with a beautiful stone or stucco exterior. Many of the homes in our area feature stone from Fond du Lac, Wisconsin. There are several varieties to choose from to begin your design journey. 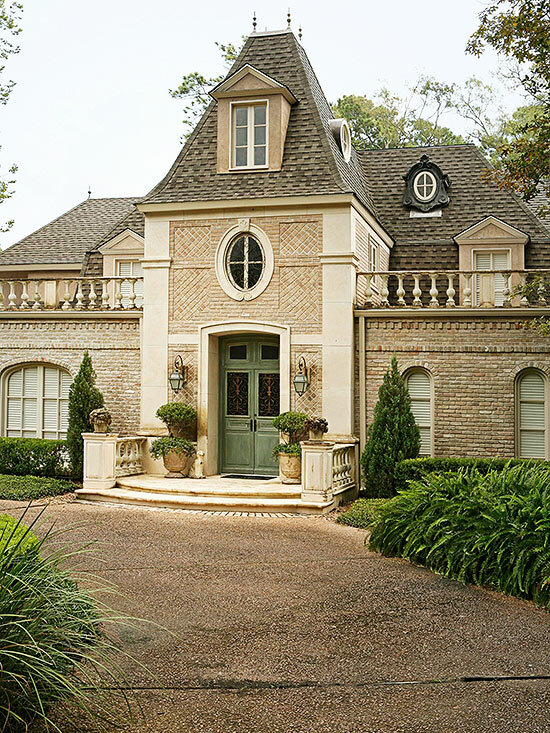 Of course, your selection of doors and windows is an opportunity to add some French flair. 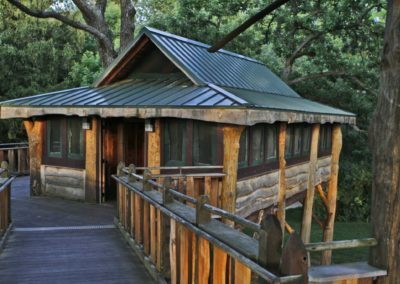 A slightly rounded arch-top door or radius-top (fully rounded) front door is definitely a show-stopper, as is a custom knotty alder plank door or a pair of oversized handcrafted wooden doors. Doors can create an immediate architectural interest and curb appeal. An inviting portico adds a nice touch, and is also an inviting feature for guests. 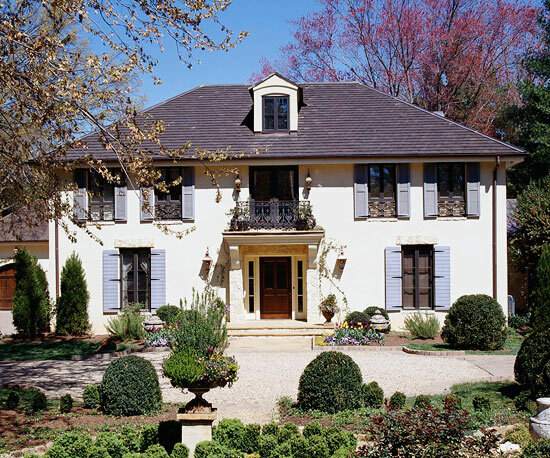 Typically, if you are building a French-style home, you would select casement windows. In Europe, they would swing in, where in the United States it seems most Americans want casements to swing out. Either way, it has been said, windows are the eyes of your home and a very important element. Consider framing the windows with shutters, which are also typical of French Country-style homes. Incorporating wrought-iron balconies for hanging potted plants provides a genuine old-world touch, too. 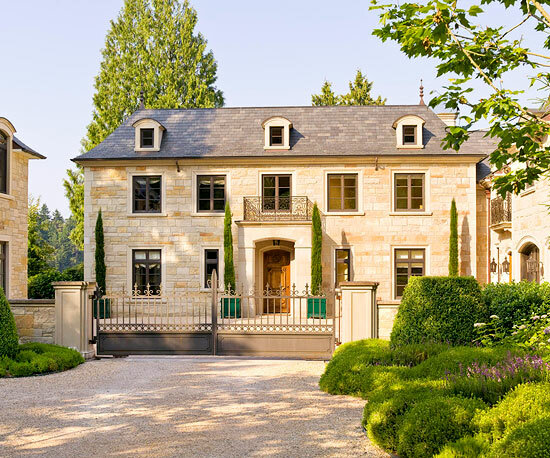 Forecourt: A crushed-stone or pea-gravel forecourt offers an authentic French experience each time you come home. Pergola: Pergolas are great for dining al fresco and beautifying your outdoor living space. Fountain: Nothing is more serene than the sound of water flowing in a grand stone fountain within your French-inspired garden. When it comes to interior doors, if within your budget, you might want to upgrade to a distressed alder wood or even walnut that is stained and lightly varnished to a striking patina. While in Provence for a local home design project, I swooned over doors like this that were surrounded by woodwork the same color as the painted walls, making a seamless transition. In some instances, there was no trim at all. The focus was entirely on the stunning doors. Pictured below: An interior walnut door with wall color and trim seamless, and an iron rail at a summer home in Provence, France designed by Mary Susan Bicicchi of Interiors by Mary Susan. Attention to architectural detail is so important when building your dream home. Ceilings, railings, fireplaces and flooring — when carefully selected — are all elements that can lend themselves to a French flair. Ceilings: Ceilings can go from elegant coffered style, which are basically beams that have crown molding surrounding them, or exposed trusses with a more rustic look, as well as many other options. 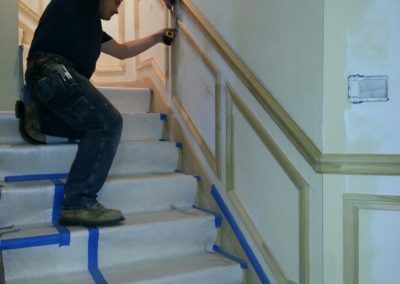 Staircases: When it comes to staircases, depending on your taste, you can do black iron or pewter tones on your staircase balusters, repeating a similar finish on your door hardware. 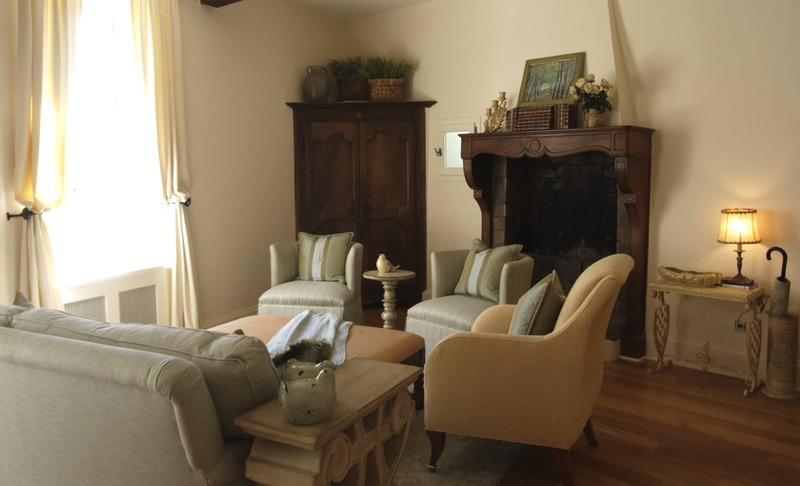 Fireplace: For the fireplace, consider an authentic limestone surround with an over-mantel for a very French look or a French-inspired carved wood surround. Flooring: Either wood floors (new or reclaimed) or stone floors (namely limestone and terra cotta) will anchor your French Country home. The pattern of these floors is critical, too! Your interior designer should recommend a pattern that’s timeless and fits well with your home’s cohesive look. 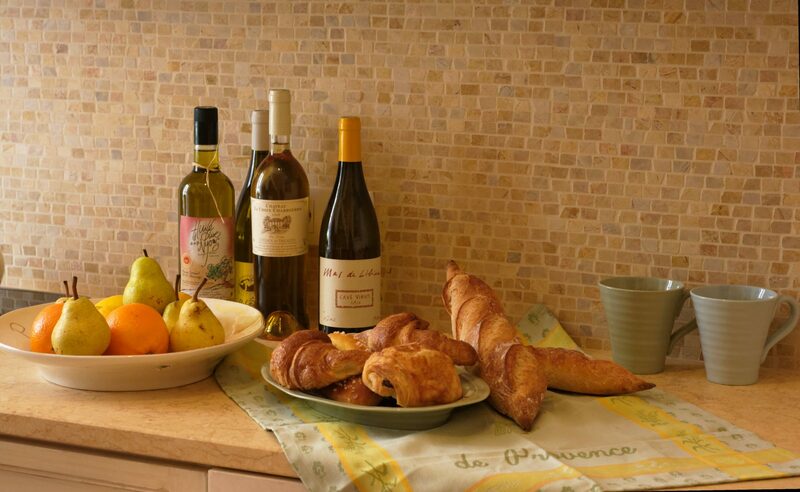 Pictured below: A close-up of the kitchen backsplash in the Provence summer home designed by Mary Susan Bicicchi. Though new, it was inspired by an old stone mosaic. 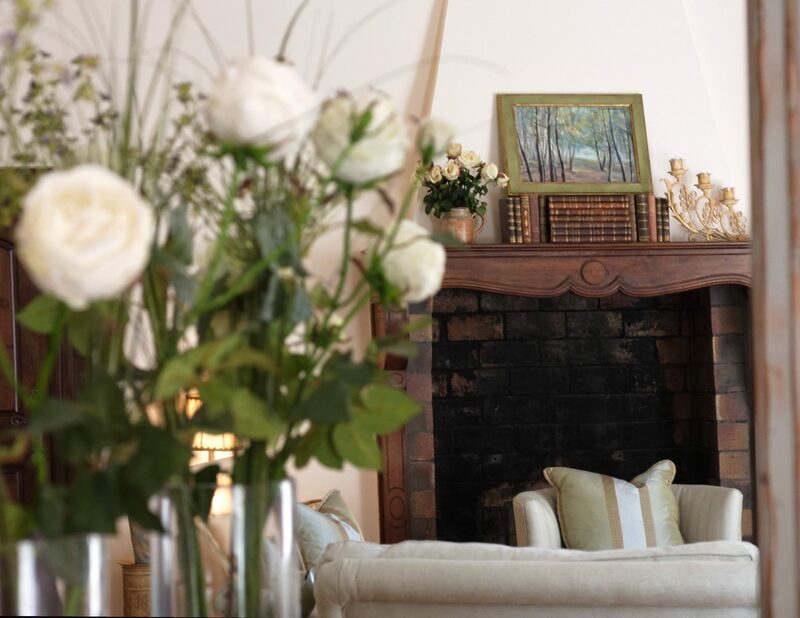 After creating a French ambience with architecture, you can proceed to the softer side of design with furnishings, wallpaper, drapery, lighting and all the wonderful details that make a house a home. 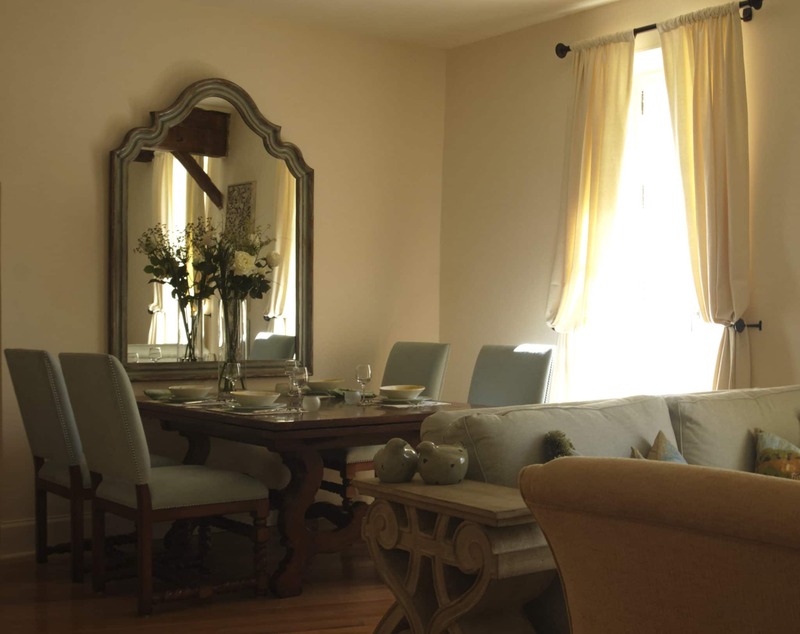 In addition to new furnishings, you can accomplish a French look by purchasing re-purposed furniture with a distressed look and visiting local re-sale shops for the perfect collectibles here and there. Consider doing clean modern lines on your upholstery, contrasted with some lovely Country French furniture. Color is so personal, but it does appear that mostly subdued hues of blues, greens and yellows seem to find their way into French-inspired rooms. Pictured below: The dining room and living room at a summer home in Provence, France designed by Mary Susan Bicicchi of Interiors by Mary Susan. designing interiors for more than 30 years, and I know firsthand that choosing the right team is the most important decision a homeowner is going to make. The value of working with a design/build team led by Donatelli Builders, Inc. is that you have a company with the skills and expertise to closely manage all of these moving parts with total dedication and quality control measures in place to successfully – and efficiently – build your home. 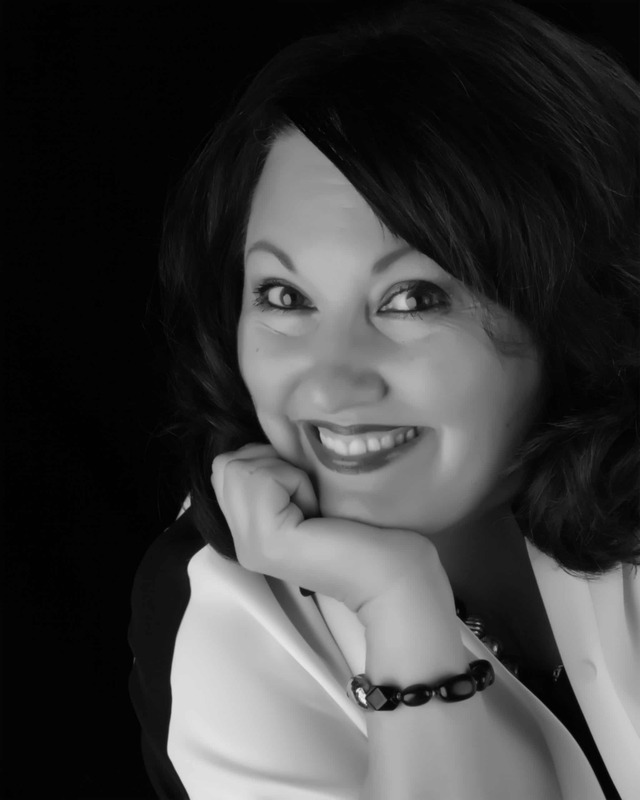 So now put some Edith Piaf music in your playlist and continue to dream on – and get started!